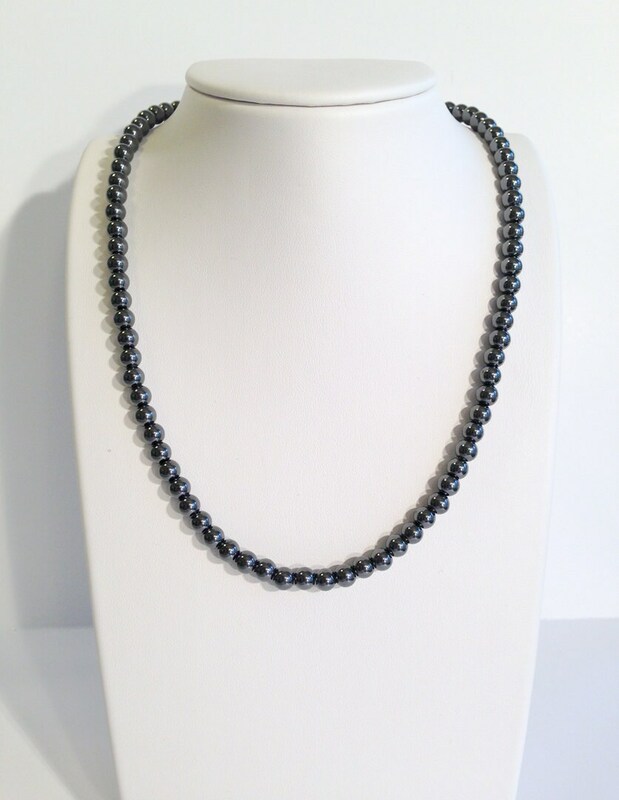 Magnetic hematite necklace in the most classic timeless style with 6mm round beads, highly polished in their natural gorgeous color and luster. 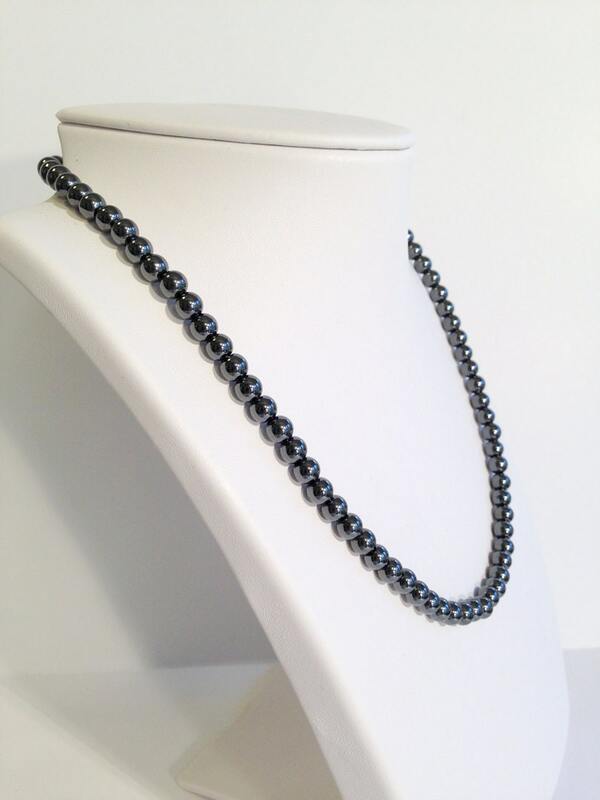 The style is a great look for men or women and the entire piece is magnetic. Custom sized to your desired length, simply select your necklace length from the drop menu. **PLEASE NOTE** read below for necklace length guide and message me if you have any questions at all. Looks amazing with casual style or dressed up. The clasp is a 5000 Gauss (very strong) neodymium pair of magnets. I use braided stainless steel jewelry wire inside with a special finishing technique which makes my pieces uniquely durable. I design my magnetic jewelry to be both attractive and beneficial. My customers have used it for a variety of things including pain reduction and improved circulation to name a couple. I myself use it for headache relief and occasional muscle soreness. Beautiful and elegant - clean style that goes with almost anything. 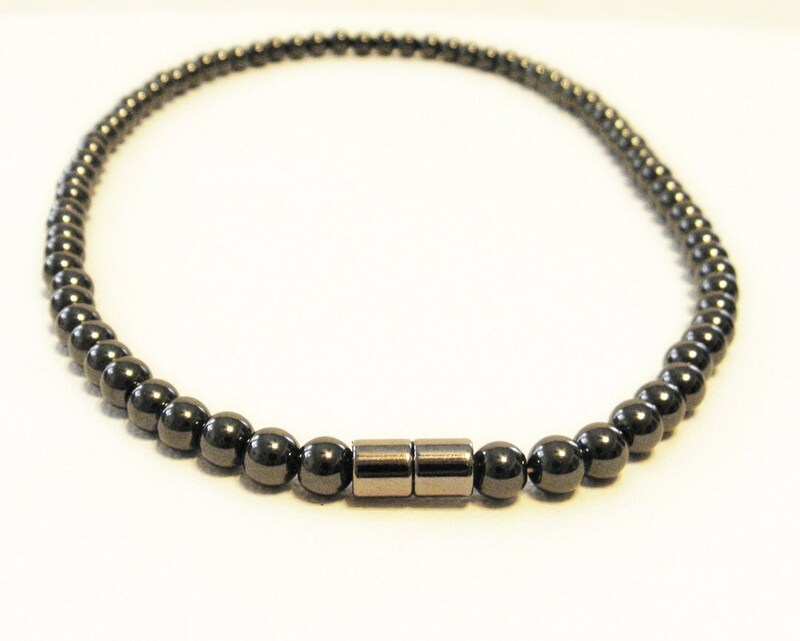 In addition to being beneficial for a variety of uses, magnetic hematite is a beautiful stone with incredible reflective luster that goes with just about anything for a clean and simply modern look. It is a hard stone and therefore durable, scratch resistant and will stay looking amazing for many years. In other words, it's low maintenance great looking jewelry for people who like no fuss accessories. All of my magnetic jewelry looks great on it's own and the pieces also look amazing layered together with other pieces. The magnetic clasps snap into place together to create flawless layering. Some of the photos in this collection show pieces layered together for a more high fashion look. Please note that the photos of layered pieces are for inspiration and style ideas, and each listing is for one item which will always be shown by itself in the first photos. If you don't know what length you need, here's how to measure to get the proper size. Take a flexible tape measure and drape it around your neck at the length you want the necklace to lay. The measurement where the two ends meet is your necklace length. Keep in mind that beaded necklaces (especially large beads) will fit slightly differently than the tape measure will lay. If you're in between sizes it's usually a good idea to round up to the nearest inch. If you don't have a tape measure handy, you can use a string and a flat ruler. Simply drape the string around your neck in the same way as you would with a tape measure. Pinch the string on each end where the two ends meet, and then place that section of string against a flat ruler to get your measurement. Keep in mind that beaded necklaces (especially large beads) will fit slightly differently than a string will lay. If you're in between sizes it's usually a good idea to round up to the nearest inch. 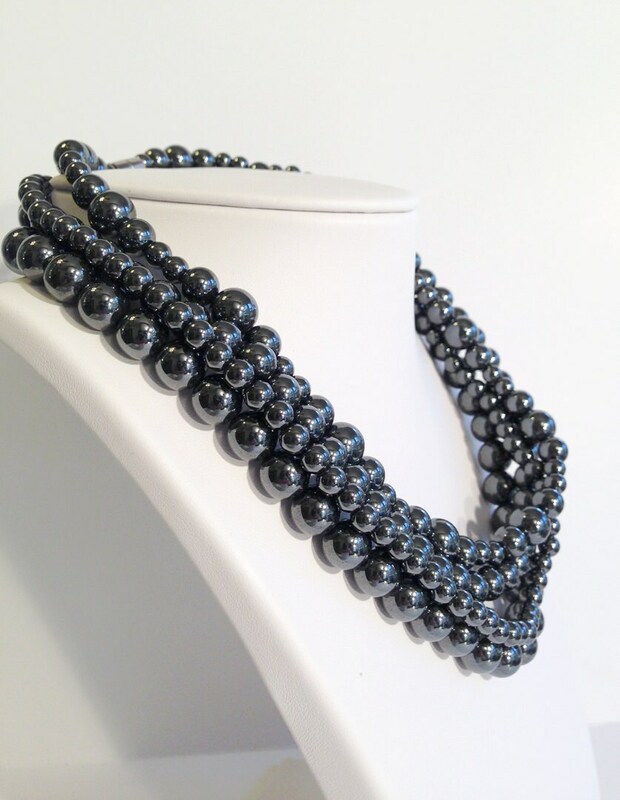 You can also measure the length of a necklace you own that fits the way you like to get a general measurement, but keep in mind that beaded necklaces (especially large beads) will fit slightly differently than a chain necklace. If you're using a chain necklace as reference and you're in between sizes it's usually a good idea to round up to the nearest inch. **NOTICE** Women who are pregnant, or people with mechanical valves, pacemakers, insulin pumps or anything in their body that is run on a battery CANNOT wear magnetic jewelry. DISCLAIMER: The United States Food and Drug Administration (FDA) prohibits manufacturers of instruments from making health or therapeutic claims for effects relating to the physical or mental illness being currently treated by members of the medical profession and/or other licensed practitioners unless said instruments have been registered by the FDA. Magnetic therapy products are not sold as medical devices or a substitute for traditional medical practices. Magnetic products do not cure disease. No guarantee of effectiveness of products is made. Reported effects vary from person to person. Keep magnets away from computer disks, videotapes, credit cards, watches or any other magnetic media. This necklace is lovely; the magnetic closure makes it so easy to put on and the delivery was quick. I’m going to buy another for my sister. I have now added another jewelry box just for me Klee pieces. I wear at least one piece - usually 3 - every day & love everything. Thanks so much for all the jewelry you've made for me. I love it. Bought one for a friend too. Reminds me of black pearls!